It’s so exciting when your child first begins to really read. I don’t know why, but my kids all hit this milestone in January. I know that it’s something that has been in the works for a long time, but, like a bulb planted last Fall and laying nascent, the leaves have sprouted and the bud is finally in bloom! My first had just turned 6-years-old in Kindergarten, the 2nd was 5 3/4-years-old in Kindergarten, and now my youngest is just starting to read at 5-years-old in Preschool. There must be something about 4 months of academic exposure at school that coalesces to explain the January timing. I wanted to share some of the books that are great for the very newest of readers. And might I add how much we hated the Bob series books — complete waste of money for us. My kids thought the Bob books were so boring with absolutely no plot. Try these instead! And please share your “a ha” moment when you realized your child can read and the book you read. Sandra Boynton books. There are so many good ones. Here’s a few of our favorites that were the among the first books my kids read to me. Good Night Moon by Margaret Wise Brown. Be sure to spot the mouse on every colored page. An enduring sweet classic. Cat at Bat by Jon Buller. Out of these books, this one is slightly harder but with a great story about sportsmanship. 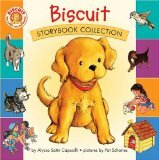 Biscuit series by Alyssa Satin Capucilli. My middle child loved these sweet and very simple stories. Five Little Monkey series by Eileen Christelow. A repetitive plot is a good thing for brand new readers and Eileen’s Five Little Monkeys never fail to please young ones. I think kids can all relate to being naughty, little monkeys! Hand, Hand, Fingers Thumb by Al Perkins. Another classic that can be a full body, drumming experience. Frogs in Clogs by Sheila White Samton. A rhyming story with a very limited but rhyming vocabulary AND a plot. The Good Bad Cat by John Sandford. The Foot Book by Dr. Seuss. I used to hold my toddler in my lap and make her feet match the book. She thought it was hysterically funny. Max’s Dragon Shirt by Rosemary Wells. This might be the outlier book but my son says this is the first book he read. It’s true; we were reading this book and I was thinking that he had memorized it because it’s one of his favorites and we own the entire series but he was actually sounding out the words. Elephant and Piggie Series by Mo Willems. My son and I love these books. Mo Willems wonderful, expressive illustrations practically tell the story and his two starring characters have a lot of personality! Here’s a few of our favorites. A nice list of classics and newer treasures. Thanks for sharing the list! Thanks for all of this great information. These are wonderful suggestions. Also, I never heard of Explode the Code and it look great.